​Congratulations to Kaylea Hepburn and Meadowlark Apache for the second year in a row! 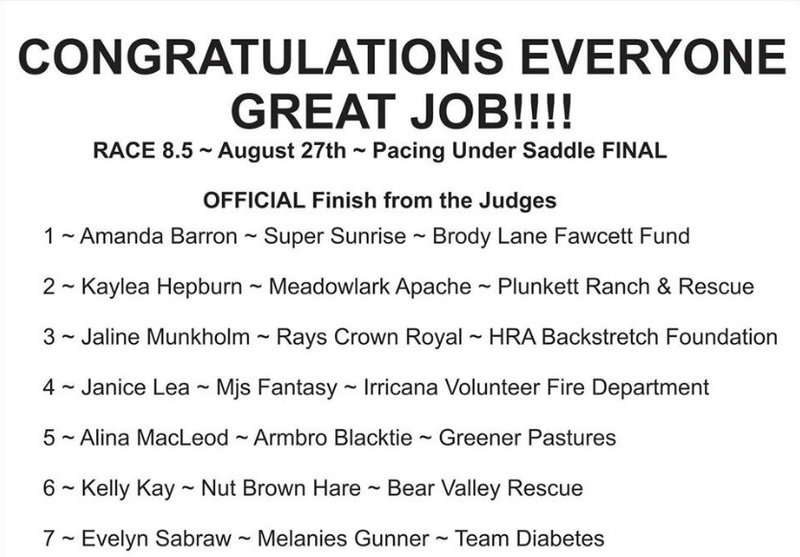 Finals were held on August 26 (also Ladies Day at Century Downs Racetrack and Casino) where seven riders determine the 2017 champion of the Pace Under Saddle Race, each riding for a charity of their choice. Amanda Barron Claims the Win Aboard Super Sunrise! The finals for the 2016 Pace Under Saddle Charity Event was held on August 27th 2016. It is believed that over $10, 000 (final figure to be determined) was raised for all the charities and non-profits involved. Amanda and Super Sunrise took home the trophy, along with a belt buckle, and cooler, who were racing for her charity the Brody Lane Fawcett Fund. It was a very exciting race and well received by the spectators, many of which had never watched harness racing previously, much less a Pace Under Saddle race. The riders can hardly wait until next year! These 8 girls will go behind the gate riding their steeds at the pace. All girls are riding for various charities to help raise awareness and collecting pledges. Come out and cheer them on! Regular races start at 1:10pm so come for some fun and enjoy the races with your friends and family (kids are welcome). Somewhere back in late June 2015, some heads got together and planning was underway for a Race under Saddle. The difference between these Racers and those at Mohawk is that these one Pace under Saddle instead of Trot. Initially there were 16 ladies registered with their horses, but we eventually dropped to 14, 7 each day. Some borrowed retired race horses just for the chance to race in this epic event. There were ladies from all different back grounds; from those who have raced aboard Thoroughbreds and had never rode a Standardbred to those who just had a passion to do this event just once. The ages of all the riders varied from 21 to 47, and there were two age groups of horses. The first day, August 29th raced 1 mare, 1 stallion, and 5 geldings from 8 to 16 years of age.